In our previous blog, we have explained the main challenge in implementing a Global HRMS such as Interact HRMS, and this challenge is the Contents. In brief, we have explained that HRMS Software is the Container while Labor and Tax Laws and the Company Policies for which the Global HRMS is being implemented is the Contents. Further, we have explained the difference between Country-Specific HRMS and Global HRMS, and this difference is mainly in the Contents. While Country-Specific HRMS come with Built-In Contents, Country-Specific HRMS comes with the Labor and Tax laws build-in in the software for the country that software is targeting, and this is out of the box. No need for any setup except for the company’s specific polices. While a Global HRMS, comes with no country-specific contents. The reason, for the later, is that a Global HRMS is designed for use by every country and provide the setup functionality and tools to setup the contents for any desired country. With this flexibility, comes overhead and that is the effort to discover and setup the target country contents. In this blog, we shall explain Contents in detail including Contents Classification, Source, Format and Structure, and Contents Management. And present 2Interact strategy and solution in deploying Built-In Contents within its Interact HRMS software. Global Enterprise HRMS software such as Interact HRMS, is used to process HR Actions, Times and Leave Transaction, and Payroll Transactions, based on specific setup and rules that are defined in support of the Country Labor and Tax Laws and the Company’s policy where the HRMS is to be implemented and deployed. 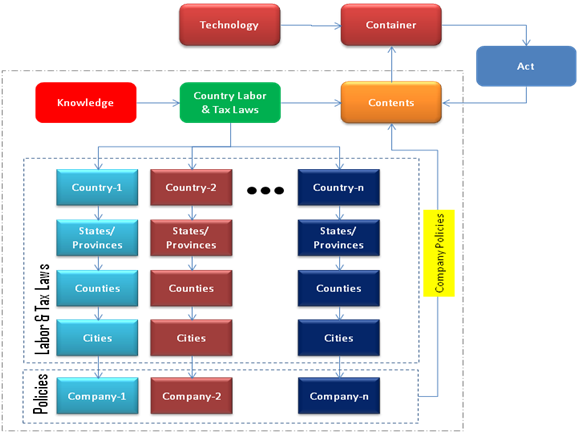 HRMS Software is the Container, while the Country Labor and Tax Laws and Company Policies are the Contents. See Figure-1 for the Contents Representation. Contents encapsulate the Country’s Labor and Tax Laws as well as the Company HR, Time and Leave, and Payroll Policies. The foundation contents vary from company to company and cannot be generalized, and thus cannot be Built-In the HRMS Software, It needs to be discovered, captured, and setup during the implementation of HRMS. Country Labor Law which govern Hiring, Termination, Wages, Benefits, Leave, Work Time, Break Time, Work Related Injuries, Safety, Equal Employment Opportunity, Discrimination, Retirement, End of Service, and many other HR and Labor Laws. In some countries like the US, the Labor Law includes Federal (Country) and Sate Labor Law, so in this case the Company/Employer must comply with both. Country Tax Laws govern employment income tax to be paid by the employee and employer. And in some countries such as the US the Tax Laws are Federal, State, County, and City. Employment Tax Laws vary from country to country. Example of Country Tax Laws: Federal Income Tax, State Income Tax, Social Security, County Tax, City Tax, Federal Unemployment Tax, State Unemployment Tax, Medicare, and Medicaid. Again Tax Laws are country specific and the company/employer must comply with country’s tax laws where it operates and pay wages. Country Labor and Tax Laws can be generalized and standardized by country. And thus this type of contents can be Built-In to HRMS Software. Company/Employer HR, Time & Leave, and Payroll Policies – This content is company specific and vary from company to company. It is used to define the Company policies that govern HR including Recruitment, Hiring, On-Boarding, Off-Boarding, Probation, Pay Scales, Benefits, and others, Time and Leave policies, and Payroll Policies. This content cannot be generalized as it is pertinent to the company where HRMS is to be implemented. Company/Employer Employee Baseline Data – This content consists of the Employee Data that includes Demographics Data, Addresses, Employee Dependents Data, Employee Job Data, Employee Experience Data, Employee Compensation, Deduction and Tax Data, Employee Training Data, Employee Leave Data, Employee Performance Appraisals Data, and other data pertaining to the employees working for the company. This content is Company/Employer specific and cannot be generalized and need to be captured during the implementation of the HRMS software. In summary, out of the four categories of contents, only one can be generalized and made part of HRMS Built-In Contents and that is Country Labor and Tax Laws as shown in figure-2. .Country-Specific Contents – The source of this Content is the Country, State, County, and City. In other words the Labor Departments and Tax Agencies of the Country, State, County, and City where the HRMS is being implemented. This type of contents can be generalized and can be part of HRMS Built-In Contents. And this is the contents of interest. Content s Format and Structure – First, we need to start with the format in which this content is available. Labor and Tax Laws of each country can be obtained from the concerned government agency through their website and these are available in HTML or PDF format in free unstructured text format. However, this unstructured format of the contents cannot be loaded into the HRMS as is. The required information/knowledge need to be extracted from the text and structured and formatted to meet the format acceptable for loading into HRMS. Contents Language and Translation – Second, the available contents from the government agencies may be in different language as we are dealing with different countries. Example, some countries may have their labor and tax laws published in French, while others in Spanish, or Italian, and so on. Before, we can extract the required information/knowledge t o build contents that is acceptable to HRMS, we need to translate the published text to English. Contents Updates – Countries Labor and Tax Laws are updated from time to time, so we need to know when these Laws are updated, and we need to extract the new updates, so we can update the contents. Again here, we need to go through the extraction, formatting, and restructuring of the content text, before it can be loaded into HRMS. Built-In Contents Periodic Updates for Clients – Shipping the contents updates to the client is a minor issue in comparison to the above three challenges. Technologies and solutions are available to enable automatic periodic updates of the contents on the client installed HRMS. In summary, there are number of challenges to discovering, capturing, formatting, packing, and delivering HRMS Built-In Contents. However, these challenges are no insurmountable. One solution is to work with partners in each country, to discover, translate, extract, and format the contents as well as provide the contents periodic contents. 2Interact believe that HRMS Built-In Contents is critical to the success of its Global Interact HRMS as it optimizes the implementation cycle, reduce cost of implementation, and reduce time-to-Production as well as makes it easier to implement, use, and maintain. Having said that and recognizing the challenges to delivering HRMS Built-In contents, 2Interact strategy is to pursue various solutions and approaches to developing, managing, and delivering Built-IN Contents. We have already developed Built-In Contents tools within Interact HRMS to manage Built-In Contents. Additionally, we are working with our partners in various countries to provide the Contents as the partners are more familiar with local Labor and Tax laws than we do. Currently, we have Built-In Contents for a large number of Countries and this number will continue to grow as we develop more partners and gain clients in new countries. Built-In Contents is critical to the success of any Global HRMS as it streamlines the implementation cycle, shorten the time to deployment and production and makes the system easy to implement, use, maintain, and support. 2Interact recognizes the benefits of HRMS Built-In contents and is pursuing the development of various technologies and solutions to the management and delivery of HRMS Built-In Contents.